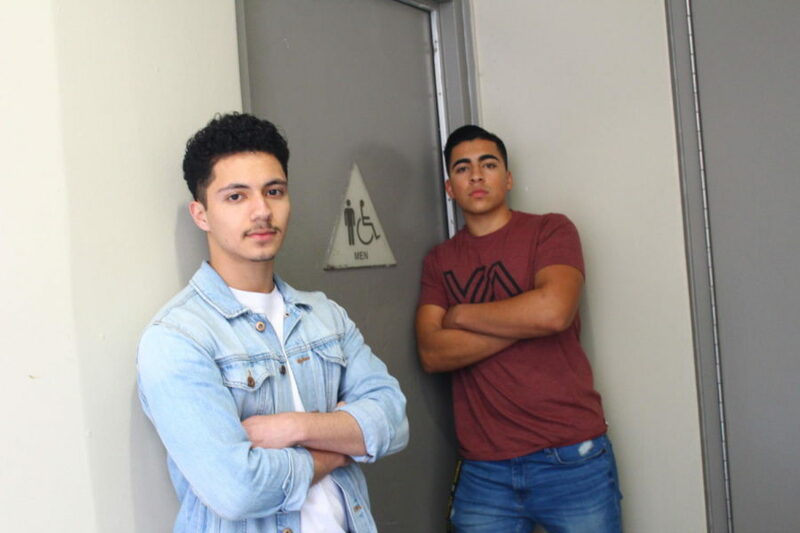 From left: guest contributors Joshua Garcia and Jesse Cendejas in front of one of the many restrooms locked during class time. Photo taken March 26, 2019 during 5th period. Ever since the school year started, the boys restrooms have been continuously locked, except for one near the cafeteria. This not only caused anger among students during passing periods, but also tardy cards. As a student, this concerns me. I use the men’s room about three to four times during school hours. The passing period gives us seven minutes to do our needs and get to class. However, there is no way we can manage that at once. I had an idea of why they suddenly locked the male restrooms, but I wanted solid proof , so I interviewed Leonor Delaguila, assistant principal, to find the real reason behind the locked bathrooms. “We are getting too many kids, particularly the ninth graders, who are smoking in there,” said Delaguila. Unfortunately, this is not the only school who has misused restrooms. In the essay “Deterring Abuse and Vandalism in School Restrooms” the author states that “restrooms often become hideaways for those students who are bent on mischief — smoking or using drugs.” However, there is a larger percentage of people who use the restrooms for what it’s meant for, than those who go to smoke. The drawback is that locking the restrooms have only stopped a few, and, there are students who smoke in the stalls, making the lines longer. Students who need to use the restroom, get irritated but they feel guilty reporting those students, therefore, the rule-breaking students are not stopped. Those individuals who are smoking substances need to be aware that smoking on a daily basis leads to mental health issues. On drugaware.com, they state that “the link between drug use and mental health issues is common.” Having one mental health issue can lead to another, and even increase the likelihood of “needing” the drug. One solution is to report any suspicious behavior seen in the restroom, regardless, if you know the person or not. Take into consideration someone’s health as well as having one less person to worry about. Our principal and administrators are trying to come up with solutions to keep the restrooms safe and open. Delaguila said, “We are trying to hire more people so that way we have more eyes out there.” In fact, she is even willing to recruit parents who are available for supervision in restrooms. People smoking should also play a role. If they want to continue smoking, at least they should wait until after school and off campus. This way, the whole school isn’t involved and everyone is minding their own business. There has to be a different method of handling this situation, for the sake of the innocents. It’s not fair for the ones who don’t do that stuff to have to hold it. We shouldn’t pay the price for stupid behavior. I believe there should be new rules applied to this because not many students like waiting long to use the restroom and its unhealthy. I looked at the California Plumbing Code and learned that there is a minimum requirement of 1 toilet per 50 male students and 1 urinal per 100 male students. I don’t know how many toilets and urinals are in that one restroom that is open but I doubt it is enough. If there are 2000 students and half are boys then there should be 20 toilets and 10 urinals. Once again I really don’t think there are that many toilets or urinals in the cafeteria restroom. That basically means locking those restrooms is illegal and the school administration definitely needs to find a solution if they want to stay out of trouble. You all want to talk about the boy’s restroom. How about we get talking about the girls restroom. Girls don’t have as much or any vandalism like the boys restroom and it gets the most administration visits. Not only are the girls restrooms locked at times, they are constantly being supervised. Not in the proper way, but to some people invasion of their privacy. The way the security rushes into the restroom in an improper way. As if she is trying to catch someone in an act. Then, stands inside for a long period and observes every one in the room, some more than others. In a place that should be private, it feels uncomfortable. Female restrooms are always more impacted than males, this has been controversial for some time now. Locking all restrooms is not helping that problem. People are waiting too long to relieve themselves. Holding in urine can weaken the bladder muscles over time and cause urinary tract infections due to bacteria build-up. Locking restrooms is taking unnecessary time away from students and teachers. It’s not helping. Unlocking the restroom would allow students to decrease the risk of getting a bladder infection because holding urine affects the bladder. Although there are students not following the rules, the school should open the restrooms but keep more supervision. I think locking the restrooms isn’t really a good idea because people that just need to use the restroom are being punished based on the behavior of other students that abuse their privileges. It’s really frustrating being in the 2nd building and having to go all the way down to the lunch area just to go to the bathroom and if the school wants students to be safe they should hire more people to patrol and supervise the bathrooms instead of locking them. There should be a new rule implemented because it’s not fair to have only one bathroom open. The bathroom issue should be viewed as a different matter because closing all the bathrooms makes matters worse for students. Many of the students have to walk from the second building towards the cafeteria bathrooms because those are the only ones that are open. This is very frustrating because it causing us to waste our time to walk to the bathrooms that are father from us instead going to the one close by. There should be a rule change regarding the bathrooms because we shouldn’t be paying for the consequences of others. Locking the boys and girls restroom isn’t going to give any result if the students who smoke at the restroom know they are checking the restroom they will just find another way to do their thing. Meanwhile, other students are suffering the consequences because we are the ones getting tardy cards or having to leave class for a long period of time looking for which restroom is opened and it isn’t good for our bladder. As a student at Godinez, I have read the rules at the back of Walker’s classroom and the staff locking the restrooms is violating our rights here, disgraceful, I’m transferring to Segerstrom I heard they let their students pee in peace. 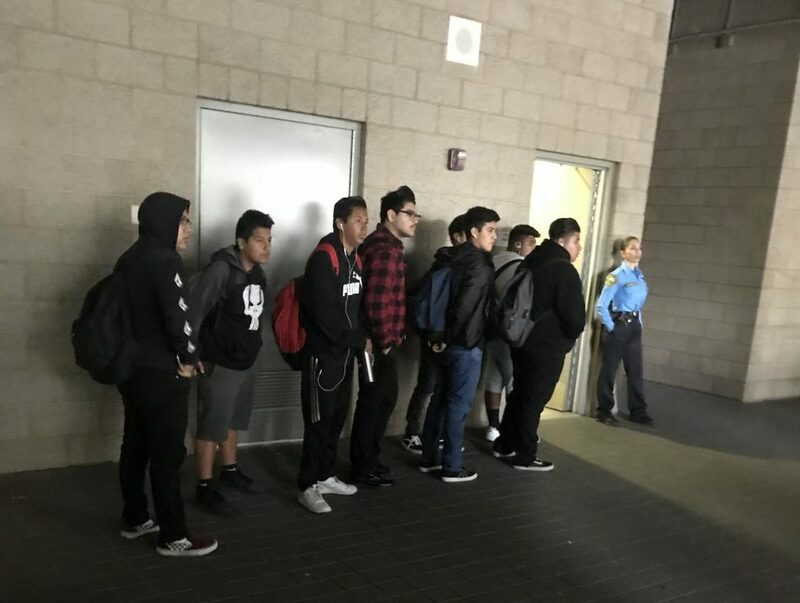 Godinez students wait patiently during 2nd lunch to use the only restroom that is available. My first year of high school freshman year, restrooms were used responsibly. Now a few years later, that has changed. This is due to the fact that the boys restrooms are always locked except for one, the restroom in the cafeteria. With seven minute passing periods to use the restrooms, there isn’t enough time and students are arriving late to their classes due to locked restrooms. As my concern and frustrations grow, I got answers from the assistant principal, Leonor Delaguila why the restrooms are locked. The answer Delaguila gave me made sense. There are students smoking in the restrooms, specifically 9th graders. Several times I’ve used the restroom this year where I saw that fog of smoke roaming through the restroom air. This type of activity happens so frequently I’m ignoring it. In 2018, 52% of all teens from ages 12-18 in California reported having smoked marijuana, which is the highest it has ever been. With marijuana now legal to adults 18 years old and up in California, the fear is that rate will increase even more. According to the essay, “Deterring Abuse and Vandalism in School Restrooms” students smoking in school restrooms is a growing issue. This essay states that school restrooms are perfect hideaway spots for mischievous students due to the lack of supervision. When I addressed this specific reasoning and the lack of supervision Delaguila said that she was going to expand the number of adult supervisors to decrease the number of students smoking. Delaguila then added that she is not going to give up until she has all the supervision needed to stop students from smoking in the restroom. So by locking the restrooms and only being limited to one, it helps decrease the number of the students smoking in the restroom. But there are many students that have medical issues that cause them to need to use the restroom. Why is it that students who use the restrooms responsibly have to suffer the same consequences of those who use the restrooms irresponsibly? Although it is frustrating only being limited to the use of one restroom, I completely understand and respect the reasoning behind the locked restrooms. I now know that it is only for the better of our school and for the better of students. I strongly support the administration for doing what they need to do to make our school a better place. If I am only limited to using one restroom to help and benefit the school, I am all for it. Honestly, after reading this article I kind of understand why the school has felt the need to lock the restrooms. Weed has shown to be harmful to some students here. That being said, I feel that the supervision and constant security guard presence in the bathrooms is just as helpful. Not to mention, some students have bladder problems and have to go in between every period or they risk a serious accident. This also causes more students to ask for bathroom passes in the actual classes, which defeats the whole purpose that traveling to different classrooms wastes time , when constantly asking to go to the bathroom does the same thing. I agree with limiting the restrooms if it is for the use of stopping such an epidemic. I think it is a great start to a bigger solution. Just as some have stated I find it uncomfortable to know that this happens so often I have become desensitized to these things. I agree with closing the restrooms because just as Jesse stated it is worth it to close them during school hours if it is for a greater cause. I think it is eyeopening because it is teaching us that one mistake from yourself can impact not only your day but someone else´s as well. It teaches to be aware of consequences. It is always unfortunate to have to move from one side of the school to the lunch area every time in class. Even then, the lines at the lunch bathrooms are long. Although easier said than done, we should punish those who are doing the actions rather than everyone that is a boy. But I know for a fact that is almost impossible to catch everyone in the act. To be honest this isn’t going to better the situation of doing drugs in the restrooms because until we have further restrictions it’s not fair for those who are just trying to use the restrooms. I think this is a problem. Its good that the security guards and other adults are consistently checking the boys and girls bathroom because of what many are doing. However, it’s not fair to everyone else because students simply need to use the restroom and the long lines and closed restrooms makes it difficult. This can cause us to be late to class which is another issue. Students that need to use the restroom because of health reasons is a really good point to bring up in this situation. OK, lets talk. let me just start off by saying that not all men are doing what y’all think we are doing. lets not accuse someone for someone else actions. I want this to be known that its not only the guys doing all these dumb actions, Not to be a snitch or anything but girls be doing some of these things too and they don’t get nothing for it. I feel like its unfair. MEN RIGHTS MATTER !!! Unlock the restrooms man our bladders hurt.